Devs reporting in - hope you all had a good start of the new year. We took some time off during the holidays, but we’ve been back to developing the new assignment system since a few weeks now. This is a continuation of the previous blog, so if you haven’t read that, I recommend to do so before you go on. A lot of you have voiced your frustration about sometimes having to shoot in industrial assignments, or searching for artifacts in transport assignments. We’d like to clean this up, so when you request an assignment from a category, you will know exactly what kind of tasks you can expect and what objectives will most certainly not show up. Furthermore, we want you to be able to stay out on the field and complete assignment after assignment, and reduce the time spent on logistics and refitting. To this end, we’re splitting up these categories into a few more specific ones. Thus far we couldn’t really do this, because most of the time we would have been left with 1 or 2 assignments in a category, and that can’t really make up a random pool. But now with the new template system we don’t need to worry about that anymore, since even with only one template in a category we should have enough randomness. So below you’ll find the new list of categories and what they can contain. I have also included the type of robot that the assignment category is meant for, and the method on how the category will scale through the difficulty levels. Straight-out killing, sometimes combined with looting specific items and their delivery. Nothing else, no artifacting or toying with distress beacons. Level scaling: We have created a point-based system for ranking all our NPCs based on difficulty. We’ll use it to spawn the appropriate type and number of enemies that you should encounter for the requested assignment level. Mining and harvesting will be two separate categories. Although the new field terminals let you refit your robot, it’s unrealistic to expect that you’ll always have the needed modules in them (or in your cargo), if they would be in the same category and a harvesting assignment would come up after a mining one. Another important thing to note here is that we'll give up the assignment-specialized mineral variants - they cause confusion for a lot of players anyway. So assignments will ask you to gather normal minerals, but now you'll have to deliver those too instead of keeping them. Level scaling: similarly to NPCs, the system also ranks minerals based on their availability on the island. So low assignment levels will ask you for a few units of an abundant mineral, and high levels may require lots of rare ones. Pick up stuff and drop it off, simple. Level scaling: Higher levels may require larger volumes to carry, which requires robots with large cargohold, or multiple delivery rounds. Includes scanning for minerals and non-combat artifacts, so the only thing you need here is a geoscanner and multiple types of ammo for it. Level scaling: In the case of minerals it’s the same as with mining, and for artifacts we’ll play with the “pop range”. This means searching for guarded artifacts or artifacts that will spawn enemies. In either case, you’ll need weapons and a geoscanner for this one. Transport objectives combined with reverse engineering or mass production. Only available in main terminals and outposts. A complete industrial process, which may include everything from raw material gathering to the final mass production and delivery, with transporting the intermediate products in between. Due to the randomness of assignments, the old method of simply giving a NIC value to the templates wouldn’t work. There are a lot of factors that would make some assignments not worth doing and others overly lucrative if we did that. So in the new system we’re assigning the base rewards to individual objectives, and apply a few situational multipliers to them. And this is where the system really comes together, since we have a lot of variables that we can work with: NPC rankings, mineral rarity, quantities, item volumes - we can even calculate the distance between objectives and assign a reward to that. In the end all these will be summed and result in the final assignment reward. This calculation method also allows us to show you where you stand with the rewards while you’re doing the assignment, and update it in real time - this should give a nice additional feeling of progress. You already got a little taste of the island rework process in the last patch, where we included a search function for the world map - and trust me, you'll need it. Since we’ll need to place a lot of field terminals and new objective buildings on the islands, we’ll use this opportunity to do the promised teleport and highway network revamp, and be done with all the island changes in one go. Make traveling between islands and terminals as painless as possible, but not instantaneous - traveling should be fast, but you should still have the feeling that you went to another part of the world. Try to give the currently deserted outposts more exposure by leading the main transport routes through them. A final note here: once the rework is done, we’ll consider reverting the speed boost change for robots, or at least slow them down a bit - we’re open to your feedback. The programming part is more or less complete, we have a working field terminal which gives us a random assignment, and we can complete it. What’s still left is the configuration/content work where we need to create the various templates and fill up the islands with field terminals and objectives, and assign a reward value to everything. In order to bring you the new features as fast as possible we are planning a staggered release of the reworked islands, starting with Alphas. This means that once we’re done with filling up Alpha 1 islands with the new assignment templates, random objectives, field terminals, and reconfigured teleports, we’ll deploy them to the test server and shortly after that to the live server. 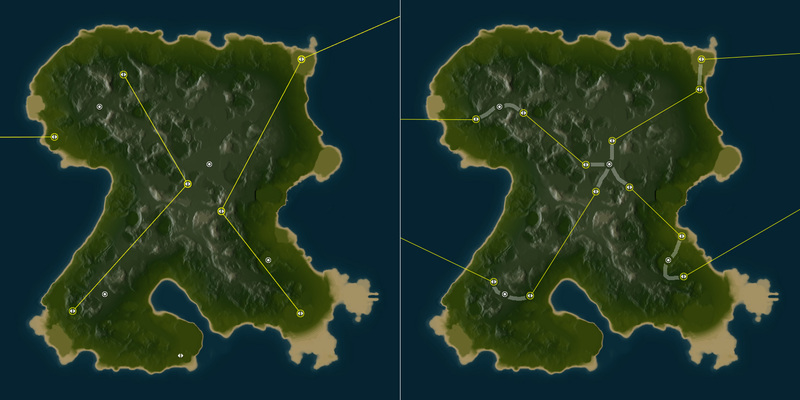 Fortunately the islands are (mostly) isolated regarding all the changes, and the random templates can also work alongside the old assignments, so it shouldn’t be a problem to have “new content islands” and “old content islands” coexist for a while. When that will happen mostly depends on how fast we can fill up the islands with content, but we hope to release the first batch towards the end of February. Of course once we’re done with the first islands it will be easier to predict how long the next ones will take. We know that quite a few of you are still having connectivity issues. While there isn’t really any news on this at this time, know that we are handling this issue as a priority, and we’re considering all possibilities to resolve it - after all, any new feature is useless if you just can’t play at all. I want to point out some key things. - Lack of key movement between islands. (prime example Novastrov to Domhalarn. - Please for the LOVE OF GOD, stop using MS Paint highlight the highways, your Arches are painfully ugly. I MEAN PAINFUL. - Unban Ville from the forums. For Great Justice. - The NPC spawns really need some toning down. Too much ewar in everything, And in dynamic spawns the amount of ewar needs to be limited to pops, like having 7 vagabonds pop at one time and your jammed out to death. - Reward/Risk needs to be upped. I need to be able to connect to the game. Seriously. 2 months still can't connect but in the day. Looks like a great update! Looks very interesting and promising to say the least. I look forward to the added content! Whats next after this is done ? Whats on the roadmap in march and beyond ? I like it, this sound to be an excellent way to "clean" the mission's system! Great!!! We're working on something for the new GUI but it's too early to promise anything. Invalid Data! Please try again later. I have not played in 2 years, and i must say... The changes i have seen are for the better! Better mission set up, better research method better better better!! What isn't better is that i lost all my recipes and have no clue what ones i had but i think i set up some that i didn't have and wanted very badly. So it is a break even type of thing! The only thing that i can see that i would like changed is the hud size, yes bigger is better in that regard! Well done! Continue to improve the game, thank you for Perpetuum!! Hello there, i'm new on this game and it's look very awesome !! Don't give up, continue to improve !!! Honestly, I believe the speed is about right. We need the ability to view npc standing while undocked AND when a tile is mined or plant is wiped out we unlock it as we would do with combat targets that are obliterated.